Ask Leo! #689 – Why Does My Machine Take Forever to Shut Down? Push the "shutdown" button ... and wait. I talk about why shutdown is probably even more complex than startup. Also this week: USB obsolescence? And what to do if the wrong person used your credit card online. The big news for me this week? My new book is out! Backing Up In Windows 10 is out and available right now. It's a collection of Ask Leo! 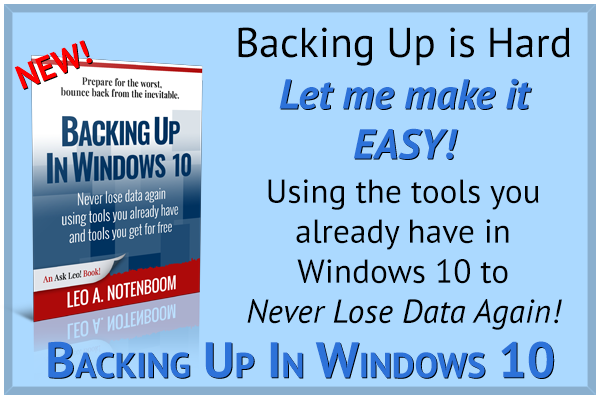 articles that walk you through getting your Windows 10 system backed up -- using the tools that are already built in -- so you never need lose anything again. And since Microsoft has announced that they're removing one of those tools (*grump*), I also walk through using a freely downloaded alternative to exactly the same effect. Don't Forget: as a newsletter subscriber you get a 20% discount off the price, even when it's on sale! The coupon code is down below near the end of every emailed newsletter. A reminder that Tech Enthusiast Hour podcast published today as well. Have a listen! It's not uncommon to complain about start-up time, or the speed of your computer while booting. As it turns out, the amount of time it takes to shut down is another source of occasional frustration. I mean, how long should it take to turn something off? Why can't it just shut down now without pulling the plug? As always, there are many possible reasons. I'll review the most common. It's important to realize that turning off your computer is almost as complex a process as starting it up — perhaps even more so. That all takes time. Sometimes it takes a long time. And sometimes there's a problem. What about all the programs running that you didn't start? It's common to have many programs start automatically when you sign in to Windows. From security software, automatic update utilities, to communications tools like Skype, they impact the amount of time it takes for your system to start and shut down. Each program has the opportunity to take time “doing something” before they exit. What Windows Startup Programs Do I Need? is a good place to learn what starts automatically on your machine, and some tactics to determine whether they're needed. Finally, there's the issue of malware. There's taking too long to shut down, and there's never shutting down at all. Everything I've discussed above applies to both situations. Never shutting down could be due to the software you're running, device drivers, hardware issues, or malware. The difference is that being slow may simply be a side effect of everything working as it's supposed to. The real problem with shut-down delays is that there's rarely a single cause; each situation is different. Related Links & Comments: Why Does My Machine Take Forever to Shut Down? At least two articles on the future claim that either USB sockets and/or Flash drives will disappear in 5 years or more. I use mine daily. Should I stock up on flash drives while I can? The article(s) in question predict the USB port's demise on two things: cloud storage replacing local, physical storage, and smaller mobile devices that leverage the cloud with no ability to connect to external storage devices. The problem is, they're absolutely right: much of the technology we take for granted and rely on today will be replaced by something. The question isn't whether it will happen; the question is: when? Continue Reading: Are USB Ports Going Away? Someone used my credit card online without my permission. My American Express statement showed a charge for software that I had not ordered. I notified Amex and they checked it out and said that the charge appeared legitimate. The problem was that the order data supplied was my card number, my address, and everything else, except the email address was not my email address. What you've experienced is very close to identity theft. Besides your credit card number, someone knows enough about you to correctly fill in the billing address used to verify card ownership. The opportunities for full resolution are few and difficult. Can the email address be traced? It's extremely unlikely. Can the software be disabled? Ditto. Let's look at the steps you should take when this happens, and why resolution is rarely satisfactory. Continue Reading: What Recourse Do I Have If Someone Used My Credit Card Online? « Previous post: Ask Leo! #688 – Why is Backing Up Your First Recommendation for Everything?